The SCG has been hosting the ‘Pink Test’ as the New Year Test to support the McGrath Foundation since 2009 in remembrance of Glenn McGrath's late wife Jane McGrath. 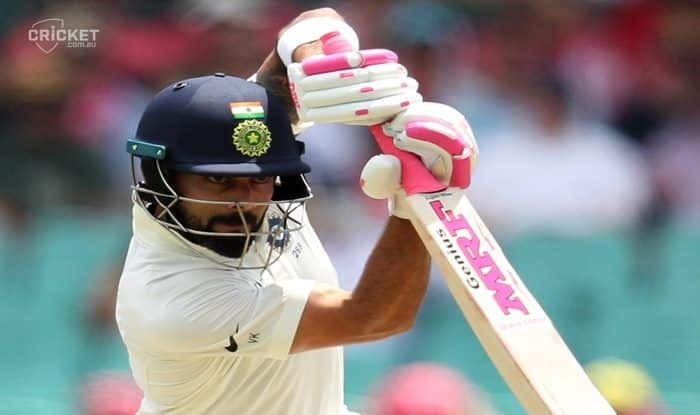 India vs Australia 4th Test Sydney: The world’s greatest batsman – Virat Kohli once again won the hearts on the cricket field of all his fans around the world with a heart-touching gesture. During the ongoing fourth and final Test against Australia in Sydney, Kohli extended his support for a noble cause to raise breast cancer awareness as he strode out to bat at the iconic Sydney Cricket Ground (SCG) on Thursday. Coming out after the fall of Mayank Agarwal’s wicket in the 34th over, Kohli was seen carrying a bat which had a pink MRF sticker and a pink handle along with gloves which had a dash of pink on them. The SCG has been hosting the ‘Pink Test’ as the New Year Test to support the McGrath Foundation since 2009 in remembrance of Glenn McGrath’s late wife Jane McGrath. SCG hosted its first Pink Test way back in 2009 when Australia played South Africa. For the last 10 years, Australia have continued the tradition and the team was photographed in their Baggy Pink’s to preview the Test. The Pink Test saw a sea of pink at the SCG – from the wickets to the boundary lines, everything was pink in support of a noble cause of breast cancer support in honour of former Australia pacer Glenn McGrath’s wife Jane McGrath. The Australian team was also photographed in their Baggy Pinks on the eve of the fourth Test. Both Indian and Australian cricket teams also wore black armbands on Thursday in memory of Ramakant Achrekar and Bill Watson, respectively. The Indian cricket team is wearing black armbands as a mark of respect to Sachin Tendulkar’s childhood coach Achrekar, whose family confirmed on Wednesday that he had passed away due to old age-related ailments. The Australian cricket team was honouring former Australia and New South Wales batsman Bill Watson, who passed away recently aged 87.